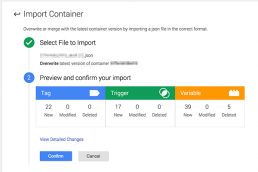 As you may know at the tail end of last year Google released an updated version of Google Tag Manager. They revamped the look and feel and changed the names of a few key features (like Macro to Variable, ) and actually simplified a bunch of other things. There’s a great article on the Lunametrics blog covering most of the changes and everything you need to know. Google have stated rather ambiguously that at some point in January 2015 legacy accounts will be automatically upgraded into the new UI. Personally, I’d like to have a little more control over the process rather than let it happen at some point. Think about what happened when Google ‘auto-upgraded’ to universal analytics…events stopped tracking, goals stopped tracking…there was chaos. I’d feel much more comfortable upgrading a legacy Google tag manager account myself and knowing for sure that there aren’t any issues and that we’re still tracking everything we need to be. Luckily for us the process is quite simple – although it does call for one small tweak to the code on your website. Few caveats – you’ll lose previous container versions – meaning you won’t be able to restore a particular version straight from the new UI – but of course you can always export the version you need from the legacy account if and when you might need it. Within the legacy account navigate to the Import/Export option right at the bottom left. Then select the version of the container you’d like to migrate and hit ‘Download’. Create a new account or container within the new UI. 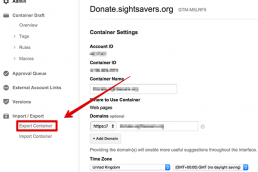 Navigate to the admin section and click on the Import Container option. 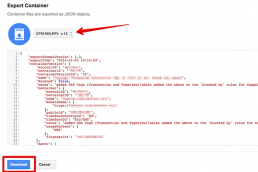 Select the .json file you recently downloaded (check your downloads folder). You have the option to merge or to overwrite – seeing as this is a migration (and the recipient account is currently empty) let’s choose overwrite and then hit ‘Continue’. If all goes well you’ll then get the option to preview all the tags, triggers and variables that are about to be imported. Do have a good look through these and make sure nothing’s changed or missing. If something’s not quite right – you’ll get an error message with some very helpful, detailed feedback about which part is wrong. Use this to debug the existing container within the legacy account. If all is well you’re good to go. Hit ‘Confirm’. Now’s when you’ll need to tweak the code on your site. 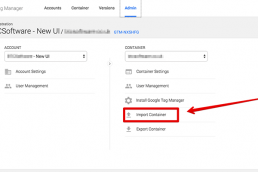 You need to update the GTM ID with the ID of your new container you’ve created within the new UI. Once that’s done you’ll be able to preview and debug your newly created container. Obviously make sure everything’s A-OKAY before publishing the container. Upgrades aren’t easy so don’t despair if you run into issues. Allow plenty of time for bug fixing and make sure you double and triple check the tags are all firing as you’d expect before declaring the migration complete.